Both a family and a community institution, Kelly’s True Value (former name- Lunt & Kelly Hardware) has served Newburyport citizens for the past 66 years. Founded by Kelly’s father, Edward Kelly, and the senior Kelly’s partner Malcolm Lunt, Pete Kelly first stuck his toes into the business while a student at the University of New Hampshire. “My father asked me if I’d help out a bit, so I did,” he states simply. Kelly ultimately earned a Bachelor of Science in Business Administration and went on to explore various careers. His past pursuits include a stint as a civilian employee at the Portsmouth Naval Shipyard, a computer services consultant, and an on-air personality for a local radio station. Pete Kelly’s delight with the way history has turned out is etched on his face, evident by the wide smile he is unable to suppress as he tells his story of ending up at the helm of the family business. He beams and his eyes sparkle when he shares that his two daughters, Lisa, who manages the hardware store and Kate, who operates the rental shop, have joined him. “They were inspired by their dad’s entrepreneurial spirit,” he jokes, self-deprecatingly. 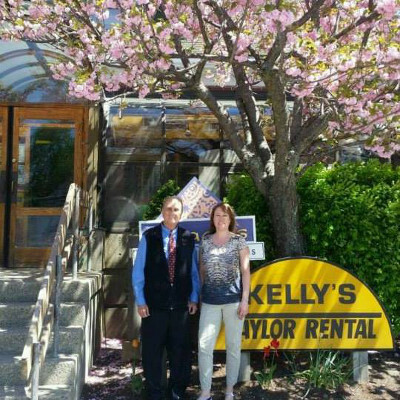 The ability to perpetuate the family business is very rewarding,” says Kelly, which for the last 15 years includes the adjacent successful Taylor Rental business. We work together with many local businesses for their rental needs. These business relationships also provide the ability for us to give referrals to our vendor "friends", and to receive referrals from them as well. Below is a list of some local businesses you may want to consider for any upcoming events.